Associated Student Body President Elam Miller wants to improve student relations with the Institutions of Higher Learning (IHL) Board of Trustees by implementing a student agenda and gaining official student representation. IHL is the constitutional governing body that oversees the policy and finances of Mississippi’s eight public institutions. The 12 board members are appointed by the governor and confirmed by the Mississippi Senate to represent the state’s three Supreme Court Districts. Because of this, Miller said that to add a student trustee to the board, there would have to be an amendment to the state constitution, which would have to be passed by the House and the Senate. The citizens of Mississippi would then make the final decision by voting on the amendment. The Presidents’ Council is made up of the student body presidents of the eight public institutions governed by IHL. They meet once or twice a month to discuss various issues and topics relevant to their schools. Current Commissioner of Higher Learning Alfred Rankins, with whom the council met, is currently serving in his first year as commissioner and said that he plans to utilize the Presidents’ Council to get input about student issues. Miller and Rankins both said that Presidents’ Council members have always been welcome to present specific issues with proposed solutions to the board. “In the past, the student government presidents have also presented items for the Board of Trustees’ consideration and approval, including a student activities fee approved a few years ago,” Rankins said. 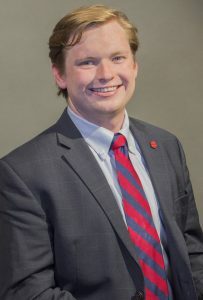 The student activities fee was presented by former ASB President Davis Rogers to the board in 2014, and this fee has now been implemented at all eight public universities in Mississippi.